The Recollective, a Celtic quartet, based in Ireland, consists of Calum Morrison, from Glascow, Scotland on vocals, guitar, banjo, tenor guitar, bodhran and Highland Bagpipes, Karen Hickey, from County Mayo, Ireland on fiddle, Michael Coult, originally from Glossop (close to Manchester), England, on traditional Irish flute and whistles, and Kieran Leonard on drums percussion, and bodhran. 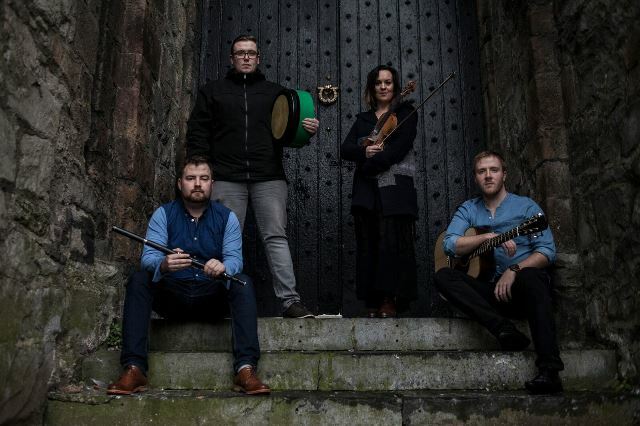 play a mixture of traditional and original material primarily from Ireland and Scotland but also from other folk traditions. They combine songs and tunes from these traditions and weave them amongst their own contemporary styles to create an enchanting vibrant sound. They will be making their debut at Caltech, the first stop on this American tour. The show will be in Beckman Institute Auditorium (Little Beckman) and tickets are $20 for adults and $5 for Caltech students and children. Tickets can be purchased on the phone (626-395-4652) with a credit card (a service charge will be added per order), purchased at the Caltech Public Events Ticket Office for face value (Generally open Monday-Friday 9AM-4PM) or purchased at the door for cash or check (no credit cards.) The Caltech Ticket Office is now in their new location at 1200 E. California Boulevard in Pasadena (Southeast corner of Wilson Avenue). Their new hours are 10:00 a.m. to 4:30 p.m., Monday through Friday. There is limited short term parking in front of the four story Spalding building on California Boulevard (note the yellow curb and the sign that indicates 15 minute parking for the Post Office station inside) Otherwise, you can look for street parking nearby. They are located just inside the door on the east side of the building, to the left of the entrance.